Seriously. Today was the first day back to school for our kids. This is what Rana came downstairs in. The sad thing ... I had no time to make her change. I just pretended that she looked fabulous and asked her to brush her hair. I did manage to get her to switch shoes by convincing her she would need her snow boots outside at play time. 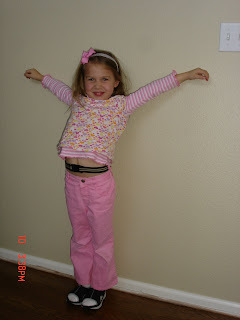 I didn't know she had accessorized with the belt until I snapped the picture this afternoon. That belongs to Owen, but whatever. I asked her where she got the idea for socks and sandals. She said she saw a girl wearing flip flops and socks while she was with Jarrod and A.J. Ah-ha! I know I'm not up on the latest and greatest, but I knew she didn't get this from me. I think she looks pretty good! Pink pants, pink shirt, nothing wrong with that! flip-flops and socks are standard practice in my world. That's something I picked up naturally in zimbabwe as they all do that in the winter. Their winters are similar to ours. No need for shoes, but in the winter we need socks with the flops. Sunny mocks me routinely, but yesterday our neighbor came over with socks in flops and he's a coastal native. HA HA HA HA! at least you got her to brush her hair. Oh guess what... I'm actually passing geometry but it seems to just get harder. Did you want some of those pictures nana had? or did you already get them? She totally matches, the other is just decoration!